A novel insect-inspired flying robot, developed by TU Delft researchers from the Micro Air Vehicle Laboratory (MAVLab), is presented in Science (14 September 2018). Experiments with this first autonomous, free-flying and agile flapping-wing robot improves the understanding of how fruit flies control aggressive escape manoeuvres. Apart from its potential in insect flight research, the robot's exceptional flight qualities open up new drone applications. Flying animals both power and control flight by flapping their wings. This enables small natural flyers such as insects to hover close to a flower, but also to escape danger rapidly. Animal flight has always drawn the attention of biologists, who not only study their complex wing motion patterns and aerodynamics, but also their sensory and neuro-motor systems during such agile manoeuvres. 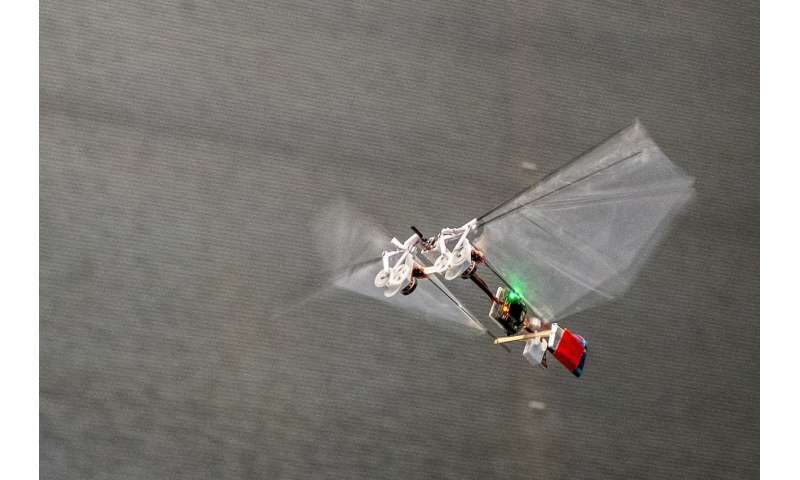 Recently, flying animals have also become a source of inspiration for robotics researchers, who try to develop lightweight flying robots that are agile, power-efficient and even scalable to insect sizes. TU Delft researchers from the MAVLab have developed a novel insect-inspired flying robot; so far unmatched in its performance, with a simple and easy-to-produce design. As in flying insects, the robot's flapping wings, beating 17 times per second, not only generate the lift force needed to stay airborne, but also control the flight via minor adjustments in the wing motion. Inspired by fruit flies, the robot's control mechanisms have proven to be highly effective, allowing it to hover on the spot and fly in any direction with high agility. "The robot has a top speed of 25 km/h and can even perform aggressive manoeuvres, such as 360-degree flips, resembling loops and barrel rolls," says Matěj Karásek, the first author of the study and main designer of the robot. "Moreover, the 33 cm wingspan and 29 gram robot has excellent power efficiency for its size, allowing five minutes of hovering flight or more than a 1 km flight range on a fully charged battery." The robot's flight performances, combined with its programmability, also make it well suited for research into insect flight. To this end, TU Delft has collaborated with Wageningen University. "When I first saw the robot flying, I was amazed at how closely its flight resembled that of insects, especially when manoeuvring. I immediately thought we could actually employ it to research insect flight control and dynamics," says Prof. Florian Muijres from the Experimental Zoology group of Wageningen University & Research. Due to Prof. Muijres' previous work on fruit flies, the team decided to program the robot to mimic the hypothesized control actions of the insects during high-agility escape manoeuvres, such as those to avoid swatting. The manoeuvres performed by the robot closely resembled those observed in fruit flies. The robot was even able to demonstrate how fruit flies control the turn angle to maximize their escape performance. "In contrast to animal experiments, we were in full control of what was happening in the robot's "brain." 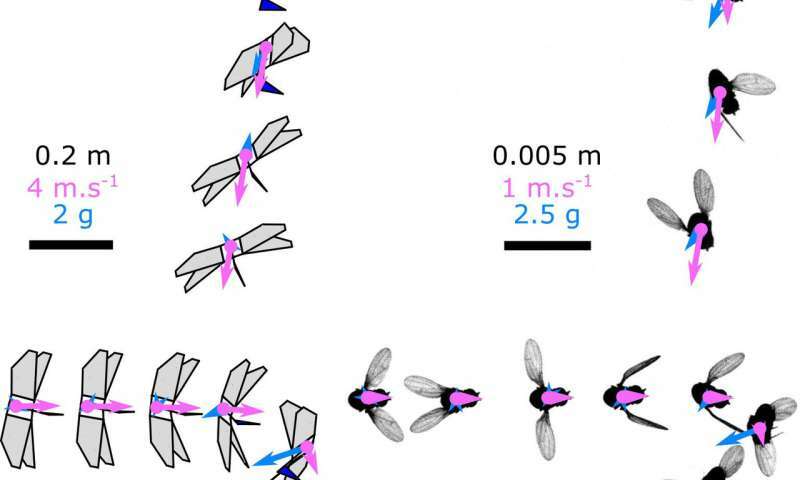 This allowed us to identify and describe a new passive aerodynamic mechanism that assists the flies, but possibly also other flying animals, in steering their direction throughout these rapid banked turns," adds Karásek. 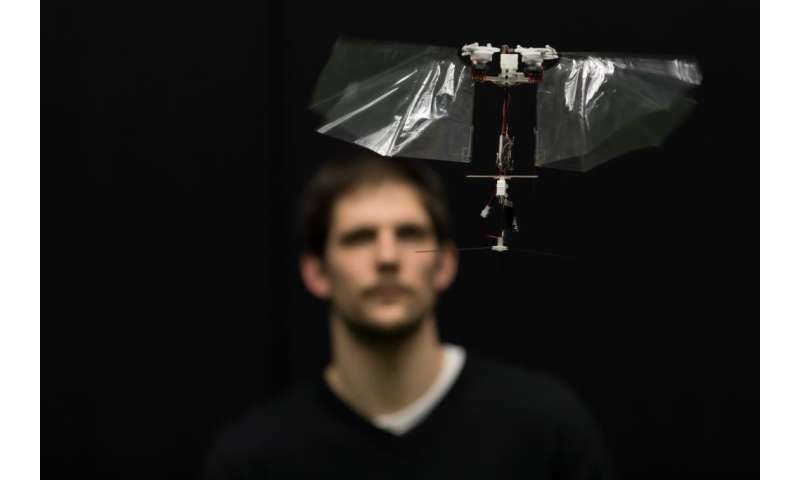 The MAVLab has been developing insect-inspired flying robots for over 10 years within the DelFly project. The MAVLab scientific leader, Prof. Guido de Croon, says, "Insect-inspired drones have a high potential for novel applications, as they are lightweight, safe around humans, and are able to fly more efficiently than more traditional drone designs, especially at smaller scales. However, until now, these flying robots did not have sufficient agility, and they required an overly complex manufacturing process." The robot in this study, named the DelFly Nimble, builds on established manufacturing methods, uses off-the-shelf components, and its flight endurance is long enough to be of interest for real-world applications. The DelFly Nimble will be further developed within the TTW project, "As nimble as a bee," which is a collaboration between TU Delft and Wageningen University, funded by the Dutch science foundation NWO.